In Greece, Easter is one of the most celebrated holidays. While we know it as the celebration of Christ’s resurrection, in Greece it is also the end of Lent and directly after the huge celebration of Apokreas. In Greece, many celebrations combine Eastern Orthodox celebrations with the traditional pagan Greek celebrations. Apokreas is in honor of the Greek god Dionysus, which is the god of rebirth. Many desserts are served at this time including Koulourakia, which combines both the Orthodox Greek and the pagan beliefs. The cookies shaped into a hairpin twist, a wreath, or coiled. The wreath represents the wreath placed on Christ’s head during his crucifixion and the coil represents the snake which is worshipped for its healing powers. This was the first time I had heard of these cookies, which was one of the reasons that I decided to try the recipe. The Greek desserts that I have tried in the past were always delicious, but, very different from anything I had ever eaten before. I was curious about the flavor and the texture of the cookie. After reading a bit about the cookie and its meaning I really wanted to try the cookie as a treat and a learning experience for my family. It was fun to show different cultures and various ways of celebrating Easter. The cookies were so sweet and soft. The flavor was not what I expected, but they were a delicious surprise. My family loved this recipe. My youngest took the sesame seeds off, to be expected (but worth the attempt). I did have them out cooling alongside baked penne, but they do have more of the appearance of bread than a cookie. 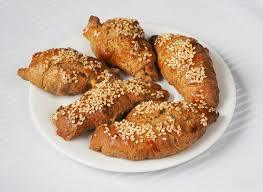 I hope to find them at a traditional Greek bakery and compare them with one another. The recipe was very simple and easy to follow. The dough was very soft, which made it nice to work with. I think next time I will make use of smaller strands to make the twist or crown shape, but, overall I think the recipe is a hit. We will add them to the recipe file and have them at Easter time. This might become a new tradition for our household. Cream butter. Add sugar gradually. Add eggs one at a time, alternating with orange juice. Add flour that is sifted with baking powder and baking soda, a little bit at a time. Should be a soft dough. Shape a desired. Brush with egg-milk mixture and top with sesame seeds. Bake on a greased cookie sheet at 375 to 400 degrees for 10 to 12 minutes. This entry was posted in Cooking, Desert, Fill Your Plate, Food, Holidays, In Season, In the Kitchen, Just For Fun, Kids and tagged cooking, Easter, Easy to make, Fun for the family, Greece, milk. Bookmark the permalink.